Ryūemon, Kichinosuke's grandfather died of tuberculosis. Kichibée regrets that he could not show him Kichinosuke's wife and tells him to marry Ijūin Suga. Kichibée shouts unless he marries anybody, his sister Koto will become an old maid and the words reach the ears of ŌKUBO Shōsuke who lives next door, his pupils and Koto herself who helps the housework of the family. Kichinosuke is busy with his job but is hurried to marry Suga by Shōsuke. At that time the US ships haunted near Japan. 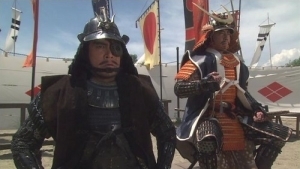 Then Shimazu Nariakira plans to be accompanied by some promising young men when he goes to Edo next time. 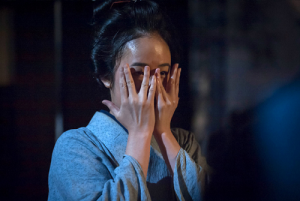 Meanwhile Masa feels out of sorts because she was infected with tuberculosis of Ryūemon. She knows her days are numbered. She and Kichibée want to make Kichinosuke marry Suga as soon as possible and plans to train her as housekeeper of the family. Kichinosuke is too poor to make ceremonial dress and Suga is too blunt to be a bride. And she drinks up some cups of sake urged by OYAMA Kakunosuke and Kichibée without expression. After that Masa lays out the futons Suga brought for the newly-married couple and says her that she will learn housekeeping under her from tomorrow. Then Suga apologises for her bluntness and being awkward. After Masa left there, Kichinosuke's younger brothers who are infant come there and enjoys the touch of their new futon. Suga's new life starts in the Saigō family. One day Kichinocuke and Kichijirō catch an eel and bake it for Masa. But she thinks of her children and never eats it. Then she offers Suga it and she who is unable to read the situation eats it in an insensitive manner. Kimi asks her whether she is acclimatized to her new family but she says honestly that she cannot say. Kichibée tells his mother that she married his son for this family and he also was asked to marry Masa. But she made an effort to love him and he advises Suga that she should love Kichinosuke first and foremost. However, he is found dead on the next morning. Kichibée dies only two months after Ryūemon passed away. Suga emphasises that it needs to bury a doll to avoid another death but Kimi says it's a superstition and she never has heard such a thing until then. But Masa's condition becomes worse. Soon after those who accompany Nariakira's alternate attendance (sankin Kōtai) is announced but Kichinosuke is not selected. Masa knows that he refused it to nurse her. 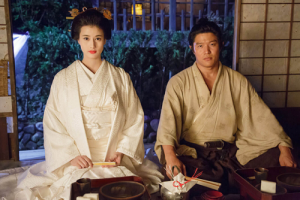 Kichinosuke tells Masa to go for a hot-spring cure but she asks him to show her Mt. Sakurajima. She remembers that she and Kichibée brought him there when he was a baby and wished he would grow up as strongly-built as the mountain. Masa is delighted with her son's thoughtfulness and dies on his back. It was the 29th of November, 1552. Her last words are "I am happy for being a mother of Saigō Kichinosuke". The images are from the official website of "Segodon"
NAGAO Kagetora atttacks Shinano with his 8,000 soldiers in August, 1553. Harunobu who is based on Shioda Castle formerly occupied by MURAKAMI Yoshikiyo learns Kagetora's attack and sends reinforcement to Maki Castle. The castle is kept by Kosaka Chikuzennokami and Kasuga Toratsuna. Toratsuna, who learned stratagem from Kansuke tells him that they won't attack the castle and goes to Sai River. In the meantime, Ritsu visits Kansuke's house and finds O-kuma is taking a nap. She tells Ritsu that she worried about her son in Harunobu's army and could not sleep.Ritsu says that's why she rests in the daytime. And in Suwa, Yu-u hime sees a dragonfly. When Shima tells her that the Nagao Army invades Shinano, she says that Harunobu will win because she saw the insect of good luck (*). kansuke decides to strengthen the defense of Muroga Castle in northern Shinano to forearm themselves against attack. 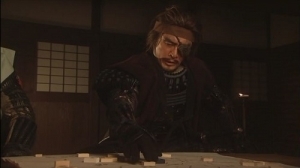 But they are still based on Shioda Castle because he plans to lure Kagetora who attempts to kill Harunobu. Many castles in northern Shinano fall and it irritates Nobushige and Morozumu Torasada. 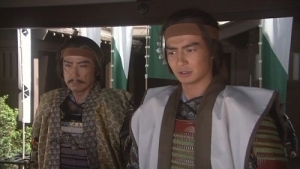 However, Kansuke thinks Kagetora will depart for Sakaki CAstle but USAMI Sadamitsu advises his lord not to do so. NAOE Sanetuna advises Kagetora to assault Shinano but it is against his policy. Then he and his soldiers dare to pass through the points where are strongly defended the Takeda Army and approaches Fukashi Castle kept by BABA Nobuharu. Then Harunobu dispatches Torasada, OBU Masakage and other soldiers to Kariyahara Castle that is close to the headquarter of Kagetora. This is a war of wits of Kansuke and Sadamitsu. And Torasada remembers that Nobuharu blamed him before (**). Harunobu hopes to move to Fukashi Castle but Kansuke stops him. At last he orders the soldiers of Torasada move to the Castle. Harunobu tells Kansuke to live long in preparation for the battles against Echigo in the future. 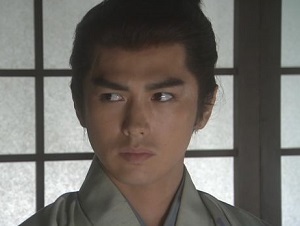 And in the castle, Denbe-é (Denbei) is asked by Mokichi, son of Takichi who does Kagetora look like. He answers that he looks exactly like himself and Mokichi realises that's why the enemy general is kept away many women (***). 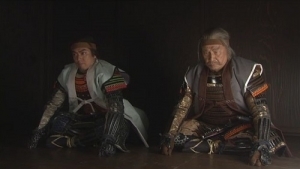 Both Takeda Nobushige (Noritoshi Kashima, left) and Torasada apologise to Harunobu for ignoring his order. Then Harunobu learns that Torasada and his soldiers returned to Kariyahara Castle. 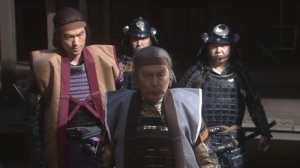 Torasada orders them to kill Kagetora who will attack the castle. 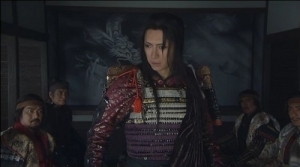 Nobuharu is surprised to hear that and Kansuke makes a night-attack on the army of Kagetora. They vanish into the night and Torasada is going to punished for having been against Harunobu's order. He tells him that he couldn't retire because of the deaths of his two sons and has lived in disgrace. Harunobu tells him that if he regards his military exploits in the past as disgrace, he should continue to live in disgrace for him. And when he hears Nobushige, Nobuharu and Kansuke worried about his safety, he sheds tears. 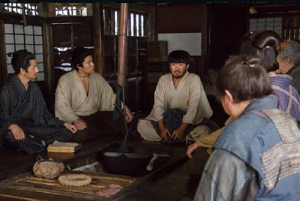 However, KOMAI Masatake informs him that Kagetora and his soldiers who retreated return to Shinano again. Harunobu makes an appearance and confronts Kagetora on the opposite side of Chikuma River. Kagetora runs his horse to the bank followed by Sadamitsu and greets Harunobu. Then they go back to Echigo. Thus the First Battle of Kawanakajima is over without having a showdown. (*) Probably it reminds her of ITAGAKI Nobukata who is symbolised by the insect in this series. (**) It seems that BABA Nobuharu's words in this episode weighs on his mind and he decides to distinguish himself though ignoring Harunobu's order. (***) In actually, Denbe-é looks nothing like Kagetora. The images are from the DVD series of "Fūrin Kazan". TAKEDA Nobukado was a son of Takeda Nobutora and Ōi Fujin, and one of the younger brothers of Harunobu. As he and Harunobu were alike, he is said to have acted his double. He acted as liaison between Harunobu and other daimyos as IMAGAWA Yoshimoto. And he also participated in some battles as the Foutrh Battle of Kawanakajima and the Battle of Nagashino. After the death of Harunobu, he took his father Nobutora who was exiled to Sugruga by Harunobu in Takato-o Castle. In 1582, when the Allied Forces of ODA Nobunaga and TOKUGAWA Ieyasu invaded Kai, he retreated but killed by the vassals of MORI Nagayoshi. He was good at painting and painted the portraits of his parents. In this series, he is described as a man who likes drawing. And he acts as secretary of Harunobu and negotiates with Imagawa Yoshimoto together with KOMAI Masatake. In this post, I write about "Aibou" (Aibō), a long runnning TV serial. 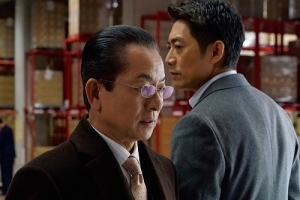 This is a detective drama series and describes Ukyo Sugishita, a police inspector of Tokyo Metropolitan Police department and his aibou (Partner) s. Though they are considered to be dead woods, they sometimes resolve an incident in an unexpected way. And the supporting characters also attract the viewers. And NHK is going to broadcast a historical play (jidaigeki) "Naruto Hichō" from next April. This is produced for the first time in forty years. 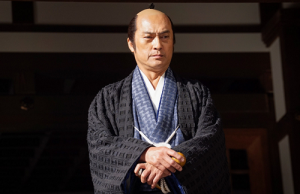 It is based on the novel written by Eiji Yoshikawa that describes the activity of a secret agent of the Tokugawa shogunate who spies Tokushima domain. I will explain it in more detail later. Kichinosuke is imprisoned in a jail of Nishida Shimo Kaisho (a kind of public office) The man is a Japanese in appearance but wears the clothes that is strange to Kichinosuke and he croons an unfamiliar song (*). And Ito hurries to Nishida Shimo Kaisho as soon as she learns the arrest of Kichinosuke. His friends who see her confusion are surprised because they think she loves Shōsuke, not Kichinosuke. But needless to say, she cannot meet him there. Kichinosuke realises that the man understands Japanese a little. However, an officer who brings them food says the strange man knows the secret of the domain in the Ryūkyū Islands and tries to kill him. Kichinosuke knocks him down and returns his home with the strange man on his back secretly. The man becomes conscious and introduces himself as "John Mung" to the Saigō family. He uses chopsticks correctly and seems to understand Japanese. Then Shōsuke who speaks to him in broken English (**) tells him to reveal the truth to them. The word "Tosa" attract their attention. So they try to know his real intention and tells him that current lord Nariakira will not execute him. John Mung doubts the truth of their words but remembered his mother in Tosa when he sees Masa who looks after her children. 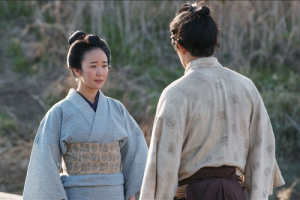 Nariakira searches his mother mediated by his younger sister Kō hime who married Yamauchi Toyoteru, lord of Tosa. 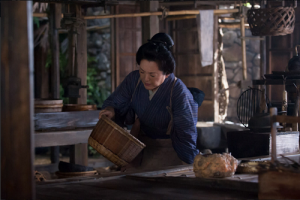 His mother who is called Shio is fine and sends his donza (padded kimono worn as working wear) to him. 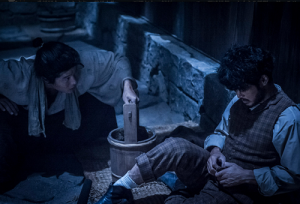 John Mung tells the Saigō family and Shōsuke that his real name is Manjirō and a fisherman. When his boat was wrecked, he and other crew were saved by the US whaling ship and went around the world. Why he returned to Japan is for the "rabu" (love) for his mother and in the US, any marriage is based on the "rabu" of man and woman and not arraged by their parents. Then he is invited to Tsurumaru Castle by Nariakira and the US plans to make Japan to open the door as a supply base. If Japan drives off the US ships, a war will break out but Japan cannot match for the US in various aspectsif the present situation were to continue. In addition, Nariakira learns that even common people can study many things and can be a president (***). He requests cooperation from him about the actual situation of the US. Then Kichinosuke is called by Nariakira. It was him who imprisoned him on purpose to unmask Manjiro. He tells Kichinosuke that he will reward him and he answers that he would like to permit Jiemon and Shōsuke as they helped him in unmasking Manjirō. Especially MINAYOSHI Hōtoku, grandfather of Shōsuke was an expert on shipwright so he will be a big help for him. But Nariakira says that satisfying the hunger of farmers must be fisrt and it moves Kichinosuke deeply. In the meantime, Ito is prohibited from going out from her father since she hurried to ask the officers to release Kichinosuke. "I, IWAYAMA Ito have loved you since my childhood." And then she marries Shigekatsu. (*) The song is "Home! Sweet Home!" 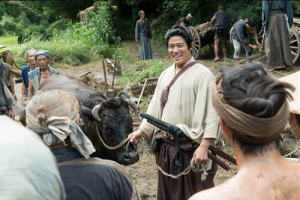 (**) Shōsuke talks with Manjirō using an English-Japanese dictionary made by his father Jiemon. (***) It does not mean the President only but also means the head of an organisation.